I think we could all learn a lot from the Double Rainbow Guy. If you’ve not seen and heard his now famous three and a half minutes of ecstasy, click and watch it NOW. Just like the rest of us walking upright on this planet with large brains, and suffering wisdom teeth and the threat of appendicitis, for Rainbow Guy (aka Yosemitebear) a rainbow is never just a rainbow. It has to mean something. Stories are fables, and planets are gods and goddesses, and homes are castles, and every picture tells a story, and a girl tucking a wisp of hair behind her ear actually fancies you. Our tendency to attribute meaning makes life rich and it makes us human. We must allow ourselves to be in dialogue with everything our senses encounter. 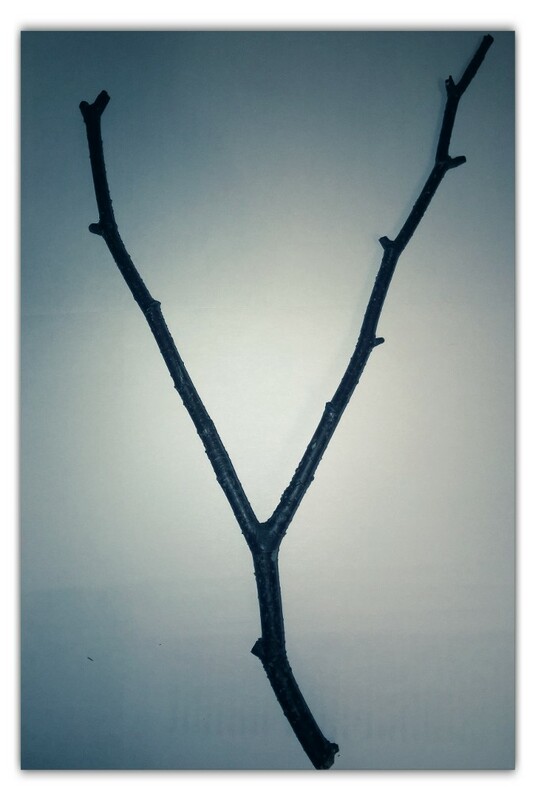 I think philosophy has big words for this kind of stuff: existential phenomenology, personal mythos, cosmogony… but let us be spared them as I unfold ‘the secret language of twigs’. 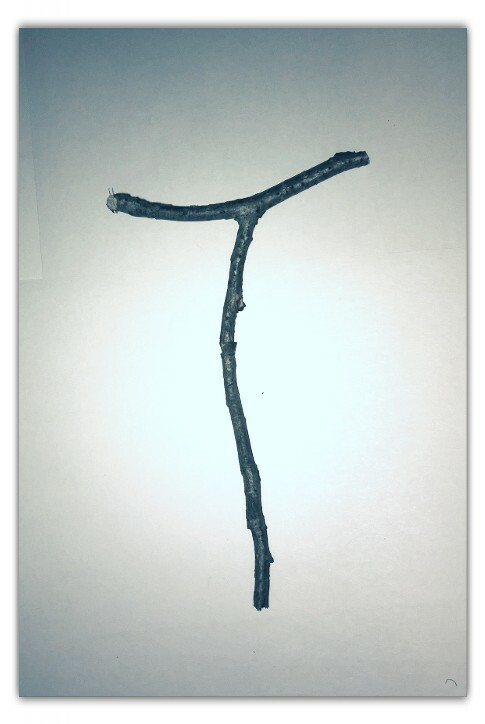 My dog loves sticks. She also happens to be one of my most trusted spiritual directors. Many are the things I’ve learned in her company. I thought perhaps I should take her fascination with sticks more seriously. At first I noticed how different species have distinctive ways of growing that give rise to endless variations within the parameters of their genes. The elder speaks with one set of forms, and the beech with another. And then, a whole world opened up to me that means walking in the woods will never be the same again. 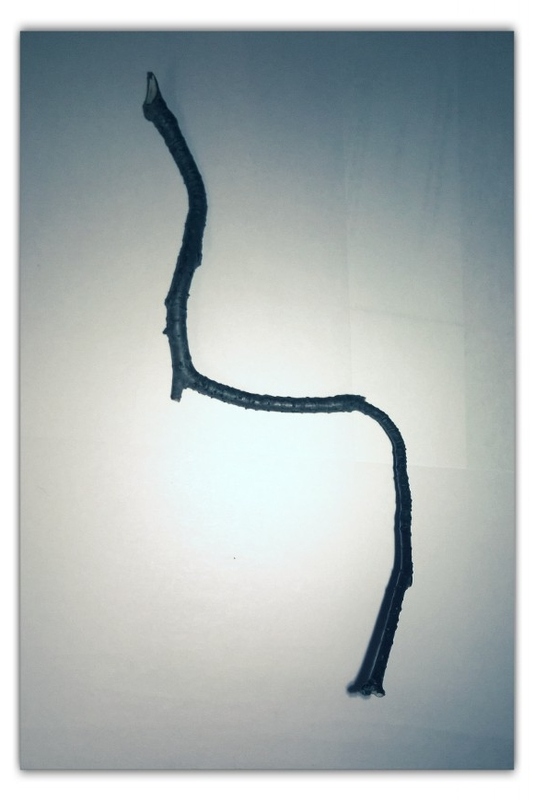 Divided Way – The most common and fundamental form of branch. Growth divides and divides again to the left and right. Even choosing not to make a choice is itself a choice. even if you were to discuss year in and year out how you could mention nothing more awesome than a choice, what it is to have choice! For though it is certainly true that the ultimate blessing is to choose rightly, yet the faculty of choice itself is still the glorious prerequisite. 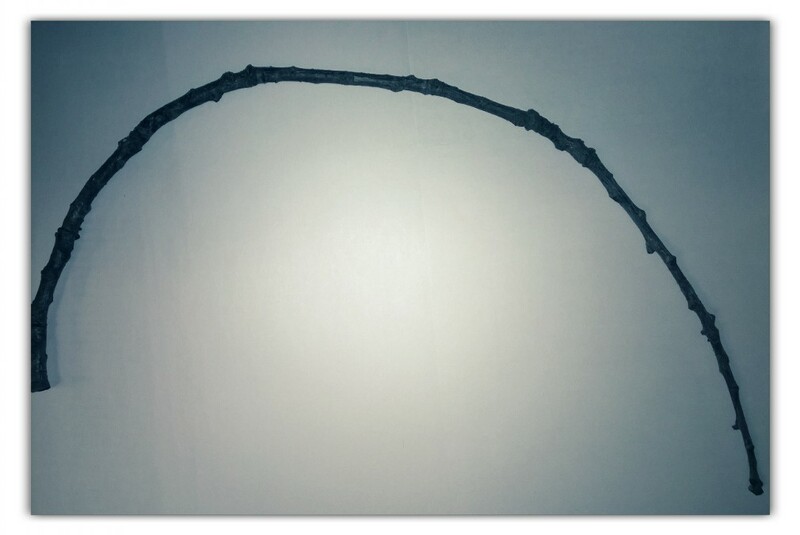 The top of a wayfarer’s staff often has a fork in it; how many times must a traveller decide between two paths? Flip it over and you have a confluence of two ways. I’m more aware of divergence than confluence in life. The latter happens so quietly but suddenly you find that someone else is with you, or two creative ideas have joined to make a third. I don’t mean a ‘middle way’, but there’s almost always another option that evades us when we are double bound and damned if we do or don’t do one thing or another. Other people often present us with an either/or, forestalling our capacity to step back and think creatively whether there’s a potential we’ve missed. That third way may even be to do nothing. We also have here the footprint of a bird, a creature of the air that has come down to feed on a creature of the earth (a worm). Earth is marked by its feet in a way that air is never marked by its wings … ponder this. The Bow – sacred in human culture from our hunter-gatherer ancestors onward and right across the face of the earth: for hunting, making war and making music. In the Bible, when God attributes meaning to the rainbow, the original language refers to her ‘battle bow’. It foretells the hope that the instruments of war will be beaten into plowshares and become tools for nurture instead of destruction. In numerous mythologies, the heavenly bow is a bridge between the sphere of mortal struggle and the paradise of rest and peace. In Bantu cosmology, it is created by the dance of seven snakes. So, once again, Yosemitebear is not such a fool. Fe – the first rune of the ancient scandanavian ‘futhark’, signifying wealth and plenty. ‘Wealth’ meant something very different to the inventors of the runic alphabets. It was probably quantifiable in cattle. While we owe a lot of our letter shapes and sounds to these forebears, we may have lost their understanding of wealth. Mine is a number on a screen that pops up after I’ve typed a few passwords and memorable numbers on a keyboard. 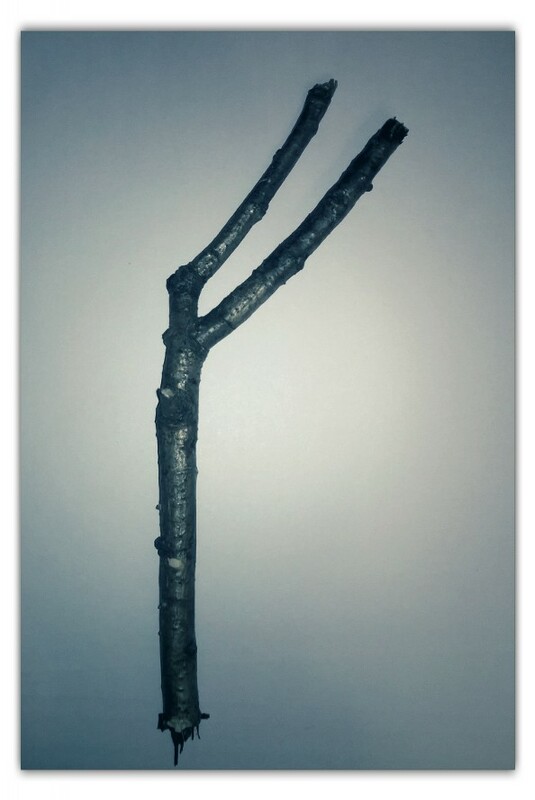 When this twig cracked under my foot it seemed to shout in twig-speak: “We are wealth! We are woods, and water, and weather! Wait and listen!” So I did. And all I could hear in the the trees was this: “Ffffffffffffffffffffffffffffffffffffffffff…” – a continuous whisper of plenty. Vav – the sixth letter of the Hebrew alphabet, whose pictographic meaning is ‘hook’ or peg. Curiously its equivalent in our alphabet is also … ‘F’ – both in sound and numerical value. As the very simplest single stroke of a pen or brush, this letter shape has been associated with one-ness and, as a sinuous curve from top to bottom, it has also been taken to represent the flow of revelation from heaven to earth. Without needing to go down a kabbalist rabbit hole, I’ve found this form deeply appealing since the moment I tried to create it perfectly with a calligraphy pen several months ago. I think the idea of ‘unity’ encompasses its meaning very well: flowing together, once again, between air and earth, my feet of clay and my wings of aether. All that I do belongs to flying or digging and the art of living is to do both at once: to pray as I work. Tau – 19th letter of the Greek alphabet, final letter of the Hebrew alphabet. 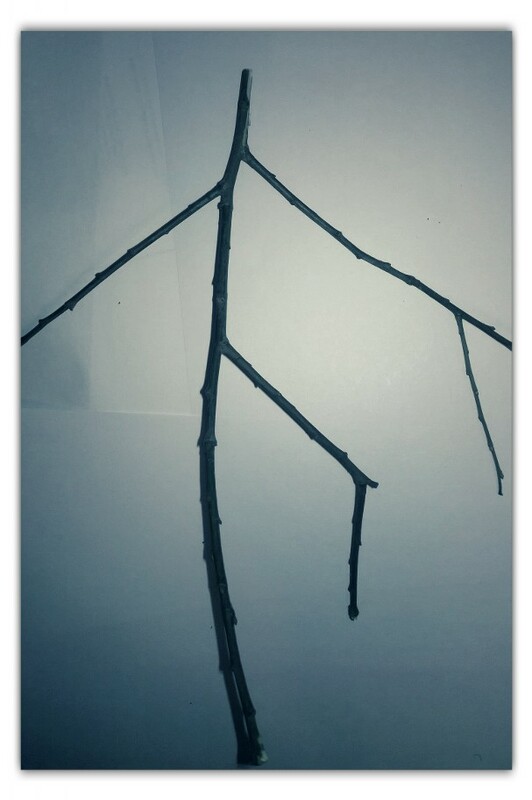 Saint Francis used this (the Tau cross) as his signature and it is fitting that this little alder twig should say his name to us, because he called the Sun his brother and the Moon his sister and was mindful of all living things. For this reason I have a slight preference for this as a sign of Christ’s cross over the traditional form (which all too readily becomes a sword). This is the final letter, the end of present tyranny and the reconciliation of the whole created order. The Dancer – let the trees of the field clap their hands! 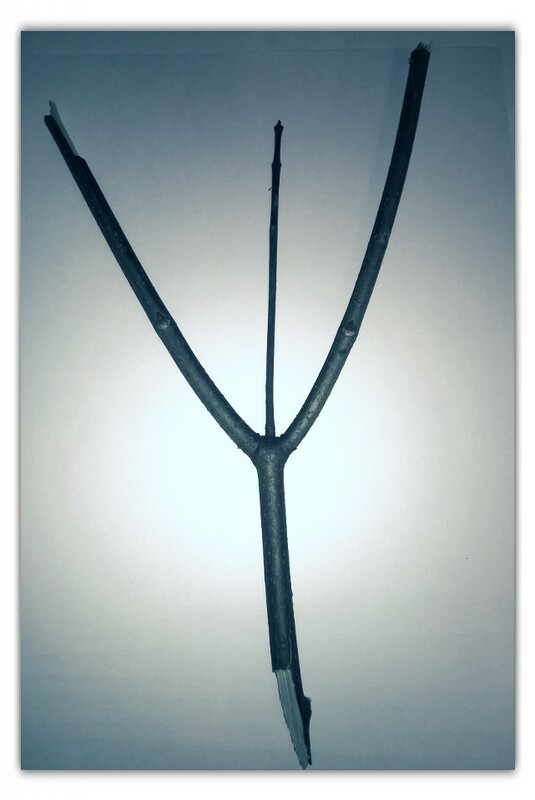 Not only did I find this exultant shape in the woods but it also looks very similar to the lines on my left palm, where I recently discovered the stick figures of two dancing people.